This entry was posted in Breakfast/Brunch, Food Reviews and tagged biscuits, brunch, eggs, fried chicken, hash browns. My co workers and I decided to go to Catch 122 for lunch and it turns out they serve brunch everyday too! Awesome! =D For some reason I am super fond of brunch food right now so this was the perfect place to be. All brunch items are $12. We went around 1pm and it wasn’t very busy so we didn’t have to wait. This was the Duck Proscuitto Eggs Benedict with Potato Hash. The duck proscuitto was salty was expected and I think it also made the english muffin a bit salty too. The eggs were nicely poached! I was expecting more proscuitto though but maybe that would be overwhelming since it’s salty? 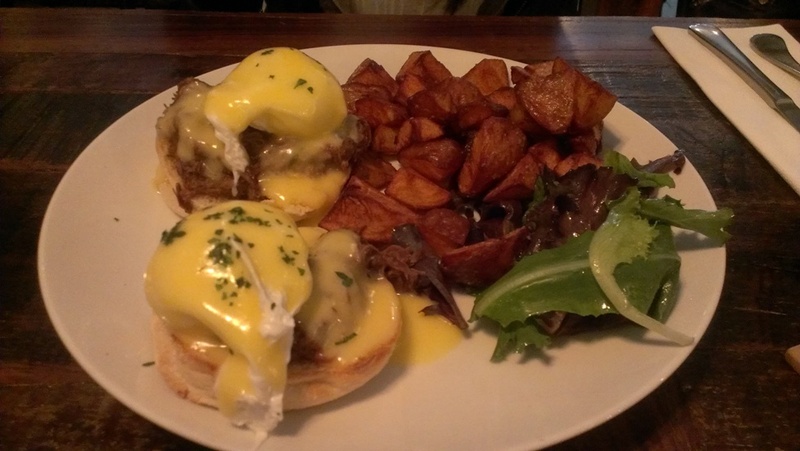 This was the Braised Short Ribs Eggs Benedict with Potato Hash. Short ribs were super tender and flavourful. Hash browns were nicely cooked too and pretty standard. 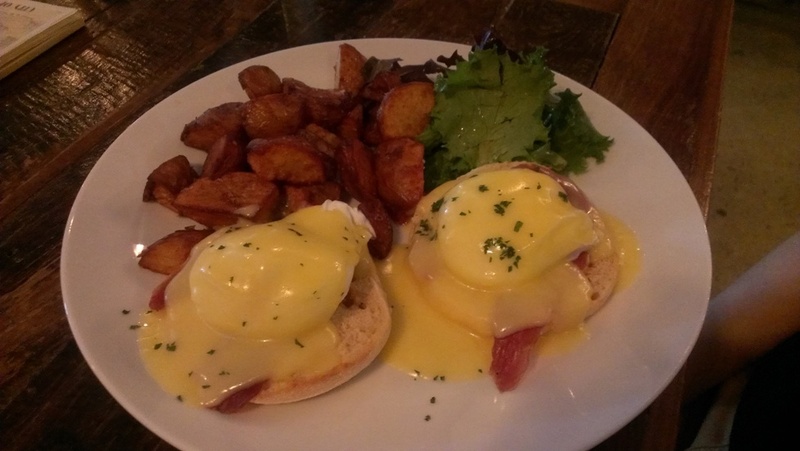 This entry was posted in Breakfast/Brunch, Food Reviews and tagged brunch, duck confit, Duck Confit Sandwich, Eggs Benedict, grilled cheese, hash browns. My friends and I decided to visit IHOP on Broadway before school started. This location is upstairs right by the 7-11 on Oak street. It looked pretty new and clean compared to the one in Richmond. The service was also quite friendly and prompt. They menu had a lot of options so we spent a long time debating what we should share. They also had a special menu where they had 7 specials all for $8 each. Nutella banana crepes with bacon and eggs :) The crepes were hidden under a mountain of whipped cream and covered with some strawberry sauce. It seems like they really don’t skimp on the whipped cream at IHOP! Makes me fat >.< There was a lot going on here so overall it tasted good because it was sweet from the nutella and the strawberry sauces. The less well presented bacon and eggs. Chicken Quesadilla. Didn’t try it but it looks pretty good with ample filling. I think this was the pick a pancake combo. It comes with bacon, eggs, hash browns and your choice of pancakes. Note the lump of whipped cream! Ok horrible angle here but I think this is another combo with red velvet pancakes!!! They were actually really good and not too sweet. I definitely like this location a lot better than the Richmond one and the pricing is reasonable too. This entry was posted in Food Reviews and tagged bacon and eggs, Breakfast, crepes, hash browns, IHOP, nutella, red velvet pancakes.